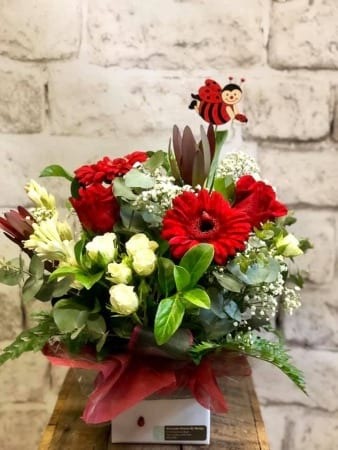 Amaranthine`s Ladybird Arrangement is a bright and seasonal display filled with blooms in red and white, gerbera, fresh white chrysanthemum, crisp lisianthus, lilies and fresh lush green foliage. Little ladybirds decorate the base of this arrangement and also adorn natural sticks throughout the display. Perfect for any room, hospital or office or a great Mothers Day Floral gift. Another unique design created by Amaranthine Flowers by Design. Your local florist in New Lambton, Newcastle.